I’m finally getting around to trying some tobacco I’ve wanted to try for a while now, from a company for which I have always had a fondness. I remember buying my first cob pipe about seven years ago. I was told it was cheap, disposable and in not many more words that the pipe was uncool. 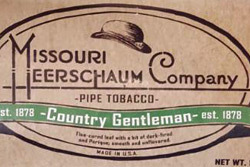 It didn’t have a white spot, perfect grain, and wasn’t made of actual meerschaum—it was Missouri Meerschaum. Almost immediately the charm of the low-brow idea of this hokey pipe grew. I fielded questions like, "Is that a real corn cob pops?" To which off course I had plenty of snarky retorts, like, no, I couldn’t afford the real thing, it’s made of paper. To this day I still have my first Washington model cob, named after the small Missouri town from which so much cob pipe history hails. I have at least a dozen and a half more, because to this day they charm me and perform admirably. "Flue-cured leaf with a bit of dark-fired and Perique; smooth and unflavored." There’s nothing fancy about any of it, and that’s fine with me—smoking quality is not something that can be hidden by packaging and marketing. The smell in the pouch is of carob and apricot. It smells sweet, just barely, but not offensively. The tawny and wrinkled ribbons are packed pretty good in the pouch, so if roughed-up too much you may have a tough time getting it closed. To be honest, I’d ditch the pouch Country Gentleman comes in and put it all in a mason jar with a good lid. Loading a pipeful is straightforward, but there’s a resistant spring of the tobacco which seems to come from heartier leaves. If you use the provided pouch packaging, your tobacco might be a tad dry, which means lighting is a cinch. The first light gives a wonderful nutty and molasses blast, but soon subsides to a leathery and spicy smoke. It’s right at the point where I like my Perique, especially if it is mixed with Kentucky or other dark-fired components. It isn’t a sweet tobacco, and it isn’t flavored. The "seasoning" sweetener all pipe tobacco has (whether you like it or not!) is here just as it should be: a little pinch in the mix to bring out character, not create an aromatic. dram of whiskey. Nothing fancy, a bourbon, a rye, or if you’re desperate—Canadian. You’ll thank me later. The parting dregs of the bowl when the smoldering is nearly over is pleasant. Back comes the Perique to say hello, a wood and tannin dryness come about and just like that—it’s over. I think subsequent bowls of Country Gentleman never needed more than a single re-light, and for those who like to forget about their smoking so they can task freely, this is a bonus. I liked this tobacco. I wasn’t sure it was going to be for me, but with some pretty bold character, a nice price point, great performance (especially in the cobs for which it is intended), my only criticism is the packaging. This isn’t the kind of tobacco you’re likely to cellar and wait a decade for the gifts of aging, but having tobacco fall everywhere and possibly dry out too much could be a hassle. If someone is so inclined, jar it up and let it age—see what happens. Why not? 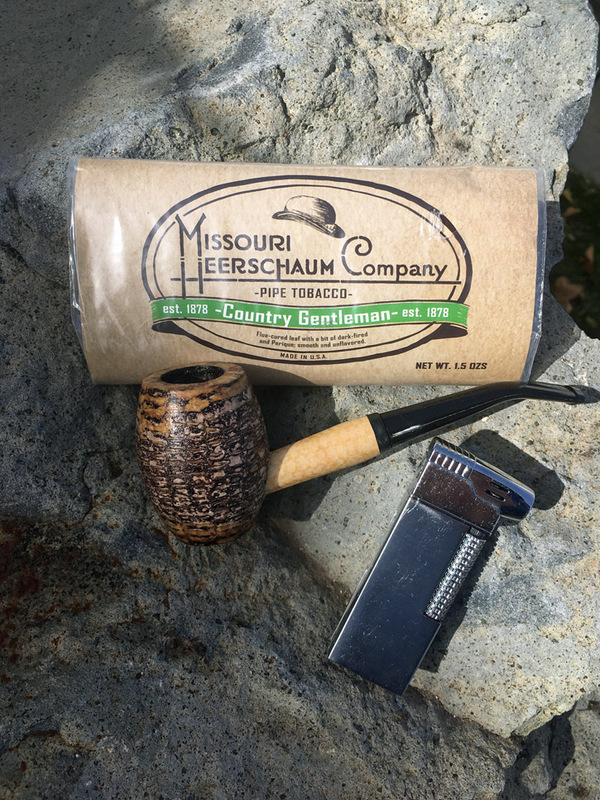 A lack of pretense and posh image is partly why I fell for Missouri Meerschaum’s humble pipes and I’m glad there’s an equal tobacco to match that spirit. I can put aside my snobbish, quasi-educated leanings and let my simple breeding out for some fresh perspective, which I enjoy. The history, location and truly American background Missouri Meerschaum boasts is well-deserved. Sure, it all seems quaint, but don’t underestimate a product that’s been around in the same capacity and quality longer than most. Since almost anyone can enter into pipe smoking and collecting at the cob level, I’d suggest giving their tobaccos a try as well. Russ understands many genres of blends, and his Americana blends are right up there with the best. He has a natural understanding of how leaf works together to give a relaxed but superb smoke. 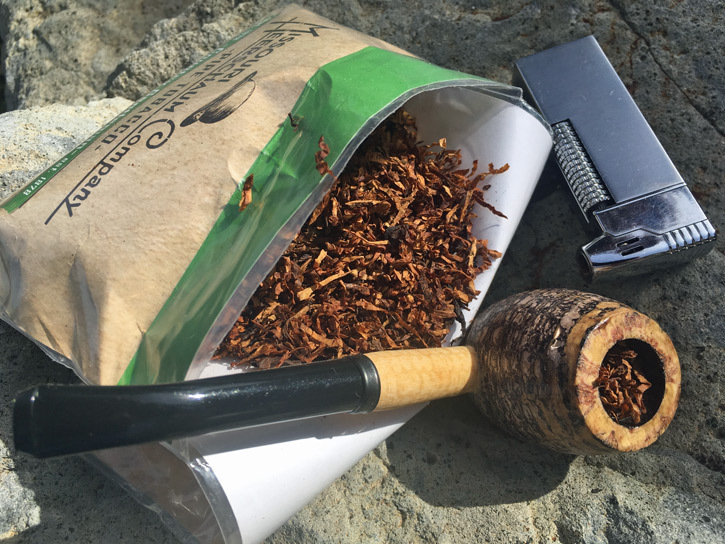 This tobacco is one of my favorites, and your review is spot-on. But you don’t have to use a cob to channel your “inner rustic” — this blend just fine in any pipe; and like you said, with morning coffee it’s “to die for”. Great review and pix. In general,I tend to like this type of mixture.So,after reading Mr. Weiss’s entry,I ordered four pouches.I tried it for first time last night.Great flavor! So……….I ordered eight more pouches.With some aging,this will be stellar.I recommend this to someone wanting to ease into the realm of Perique mixtures,as it doesn’t knock your socks off right away. I can’t stress it enough—whether short- or long-term, properly jar this stuff. The smoking and aging gods will reward you.